One of our Roland large format printers, the Hi-Fi JET PRO II combines Piezo print heads and variable droplet technology to achieve stunning color reproduction. The crisp detail and high fidelity of the Hi-Fi JET PRO II's true 1440 x 1440 dpi resolution make it ideal for enlargements of fine art, photography, or mural-size graphics. Downy soft hairs, finely textured human skin - these are but a sample of the Hi-Fi JET PRO II's amazing ability to reproduce photographic quality. Another key to the stunning color produced by the PRO II is the pigment ink which offers a combination of exceptionally bright color as well as UV stability. It ensures that your posters and signs maintain their beauty longer, even outdoors. 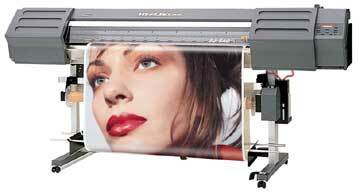 We can produce almost any size of poster or vinyl banner, colour or black & white, in high resolution. We are experts are producing these types of products for use as Point of Presence (POP) displays, sporting events, trade shows, transit advertising or virtually any other type of application. Available material and substrates include: vinyl, paper, plastic, canvas, coroplast, foamcore, Gatorboard, plywood, plexiglass, Sintra, Dibond aluminum etc. Specify whether you need UV protection for outdoor applications, grommets for rope attachment, Velcro or any other special requirements. By the way, we also do Billboards, Lawn Signs, Election Signs, For Sale Signs, Garage Sale Signs, Traffic Signs, Transit graphics, sandwich boards etc. Click here for several good sources of royalty free and public domain photos that we can enlarge and print. 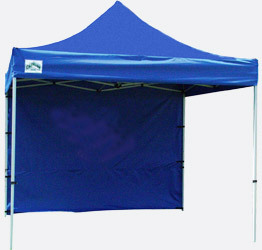 To display any of the posters or banners we produce, we can provide a wide selection of quality, reasonably priced stands. 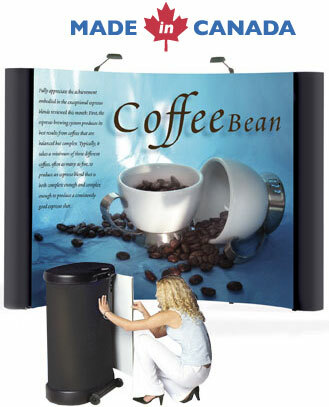 Automatic roll-up banner stands starting at only $185.00 (including a custom, high quality print!). The digital imaging industry demands innovative methods to protect and enhance large digital graphics. Precision Colour Imaging is prepared to meet this demand. Our laminating system will thermally laminate both sides of large graphics up to 60" while giving you the option of on-line drymounting of images with hot or cold adhesives, or simultaneously mounting and laminating up to 1/2" thick! A "Giclee" is a reproduction in which a digital file of an original painting is printed by a special ink jet printer that sprays ink directly on to canvas or other museum quality material. These prints can very closely match the original piece of art because of the millions of possible hues of inks and high resolution from our high end plotters. The impressive Oce 7500 can copy C or D size engineering drawings, blue prints, maps or posters (monochrome only). This machine is a high performance laser copier so the output is sharp and water resistant. Any type or size of map (e.g. seismic maps, contour maps, topographic maps etc.) can be printed or copied. We can laminate your maps to make them water resistant. Black and white copies can be made at very low cost. Precision Colour Imaging specializes in digital scanning, offering a wide variety of scanning options (including from large format film, negatives, slides, blueprints etc.). We have several high end scanners, including 12" X 18" high res flat bed scanners and a 43" wide high resolution colour scanner that can handle thick originals such as foamcore and coroplast signs (up to .6" thick). We specialize in affordable "Short-Run" labels and custom decals by producing full-colour and spot colour labels and decals for substantially less than with traditional methods. Our equipment automatically outputs and die-cuts labels and decals from your supplied file, any style or shape on paper, polyester or vinyl substrates. If your needs are very specific, Precision Colour Imagaging can provide custom manufactured advertising, die-cut prespaced type, premasking and fleet markings. We manage any graphic for any application. Examples: bumper stickers, company logo stickers, pricing stickers, specials stickers, warning stickers, transit decals (temporary adhesive), static cling etc. For vehicle or other applications, we can print directly on flexible magnetic material. This way you can easily remove the sign from your vehicle or other metalic surface. Colour, logos, custom sizes are all available. Of course we can also print small or complete vehicle wraps, car graphics or large format trailer and truck graphics of all types.